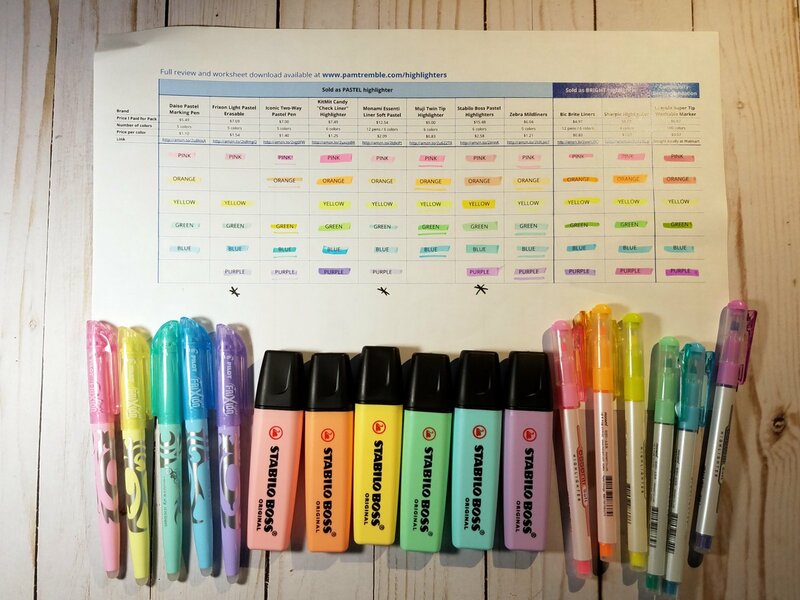 Pastel colored highlighters – 11 brands, 62 pens, 1 clear winner. This is going to be the prettiest and most colorful fight to the death you’ve ever witnessed on the Internet. There’s a video that goes along with this pastel highlighter review write-up. If you’re interested in seeing each of these highlighters swatched and listen to my silly commentary, head over to the YouTube video for the Pastel Highlighter Showdown & Review. 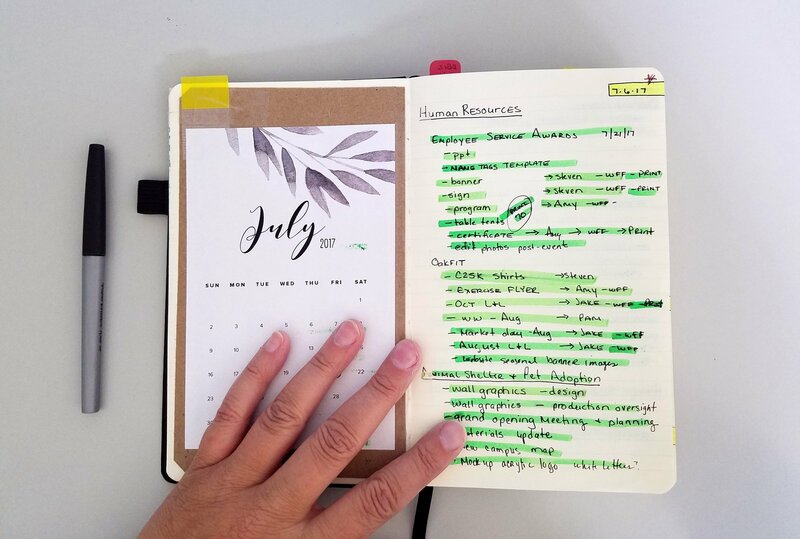 There is a craze in the bullet journal, planner, study and note-taking communities about pastel markers and highlighters. In fact, it seems that everyone is talking about the Zebra Mildliners and we’re all jumping on the band wagon to buy all four collections so we can make our journals beautiful and filled with every color of the rainbow. I admit it, I caved into peer pressure and bought the Mildliners. I know. You’re so shocked, right?! You see, I’m a highlighter type of bullet journaler. I’m a rebel in that I don’t use the bullet journal key that everyone else uses. I make a list and whatever “thing” is at the start of that item on the list, is the thing that it is. It might be a dash, it might be a dot or bullet, it might be an arrow … those symbols are all interchangeable to me. I’ve been making lists for so long that I can’t hope to change now. Then the way I signify that the item on that list is done (done means that I no longer need to think about it, not necessarily that it was complete) I cross that thing off the list in green. Green highlighter has been my go-to for the past few years. Why green? I have no idea, that’s what I’ve been using for years and I’m a creature of habit. So highlighters definitely are part of my process and in some ways, the highlighter might be even more important to me than the pen I used to write the list in the first place. Here’s the bullet journal I use at work. Once a task is complete, I simply highlight it in green to indicate that it is done and I don’t need to pay attention to it any longer. Now, back to the showdown. After that first purchase of Mildliners, and the disappointment that followed, I decided to give another highly recommended brand a try. Disappointed again. And that’s when I got serious. I was determined to figure this out on my own and forget those silly recommendations from people who didn’t have the same level of passion about highlighters that I possess. <sigh> And that brings us to now. So let’s look at what I bought, tested, critiqued, and eventually chose as my highlighter-of-choice. These highlighters have the same look and feel as the Zebra Mildliners, but they only have a single chisel tip. My first impression of writing with these is that the ink is “dry” — not dried out, but rather they are not wet. They don’t bleed or ghost through standard copy paper (20lb) and don’t have that telltale glob of ink where you lift the pen. The color is definitely pastel but the green is almost exactly the same shade of the blue. There is no purple in this pack. The price on these is about $1.10 per pen in the pack. Buy Daiso Pastel Marking Pen on Amazon. Who doesn’t need an erasable highlighter? I sort of love that feature about these pens. Someone pointed out that these have a “chalky” appearance, and now every time I look at the highlighted word with these pens, I see it too. It’s like the black ink of the word it’s highlighting is suddenly a little bit more gray than black. I don’t mind it. In fact, I like it a lot. I just wish the green was closer to a real green color. There’s no orange in this pack but the color options here are very good. The price for these is about $1.54 per pen in the pack. Buy Frixon Light Pastel Erasable Highlighters on Amazon. I sort of love the size and shape of these pens. The barrel is skinny and the pen seems a bit longer than other pens – which has a good feel in my hand. I like the ink in these – slightly more “juicy” than the previous two options so I don’t worry too much about them drying out too quickly. The green is definitely a bright lime verdant color and the blue is closer to a turquoise shade. Overall I like these highlighters. Buy Iconic Two-Way Pastel Pen on Amazon. I keep calling these Kit Kat Candy …. ugh! It’s actually KitMit Candy Check Liners – I need to get my mind off chocolate and on to highlighters. These are fat pens all around. Not only are the pens themselves big but the chisel tip is also wide. The ink is wet and ghosts through the page a bit (I’m using 20lbs printer paper) and the shade of each marker is definitely not pastel. Take a look at the video to see the issue I had with the blue pen in this pack – the top part of the chisel seemed to dry out while the bottom part remained wet. I’ve since tried to “juice up” the full tip again but nothing I tried would work fully, although in the photo above you can see that it’s almost back to normal. For all the but blue pen, these are good highlighters for normal, bright color options, not pastel, though. Buy KitMit Candy Check Liner on Amazon. The first thing I noticed about these is how pretty they are. I love the translucent cap that makes everything a bit sparkly. And the colors are definitely pastel and soft, so big bonus there! The green isn’t quite green enough for me, but that seems to be a trend with these highlighters, huh? The ink is somewhat dry but not so dry that I think it’s going to dry out… but more like it’s just not overly wet and will bleed through the page. Overall I really like these pens and they are among my favorites. Great choice! Buy Monami Essenti Soft Liner on Amazon. Everyone loves Muji, so I had to give them a try too. Clear view chisel tip is always a great feature for me so I can see the words that I’m highlighting. The ink is wet and they feel great when I’m using them. These aren’t really pastel at all – definitely more bright. I like that these are twin tips and you get a second pen for the cheap price and the pen tip on the other end is nice and bold. If you’re looking for bold, bright colors, these are a good choice but if you want pastel colors, not so much. Buy Muji Twin Tip Highlighters on Amazon. Here’s another highlighter with a big footprint in your pencil case. I wish they were skinnier and took up less space in my planner bag because I really like the color out of these pens and wish I could take them with me more easily. The colors are definitely pastel and have a “dusty and muted” characteristic to them. I wish the pink was more light pink rather than dusty rose, but overall these colors are very good. The chisel tip is wide and the ink flows beautifully. These are a bit pricier than the others but well worth the investment. Buy Stabilo Boss Pastel Highlighters on Amazon. This is where it all started for me. They’re good pens but they’re expensive if you buy all the Zebra packs (there are 4 available). The highlighter pack only came with 5 colors, so I pulled the purple out of one of the other packs to test. These are twin tips with a chisel on one end and a bullet tip on the other end. They are medium-juicy and definitely pastel for most of the colors. Buy Zebra Mildliners Highlighters on Amazon. I wanted to test regular old standard highlighters next to these pastel ones. I was mostly just curious to see how the colors stood up and if pastel really was all that much different than the bright highlighters we’ve all been using for years. So let’s take a look how that experiment turned out. Click one of the links below to jump directly to that highlighter review, or just scroll and read it all! These are highlighters I already had in my stash and wanted to try them next to the pastel versions. Yes, they’re bright, but actually not as bright as I expected when you see everything side by side. Some of these colors are actually identical to pens that are sold as pastel. Blue and purple are very much in the pastel category and the pink could stand up to some of the other pastel pinks. For a cheap and local option, these pens are good choices. I bought my full set locally at Walmart, but they sell for the same price online. Buy Bic Brite Liners on Amazon. Sharpie is my current go-to highlighter brand and even though I’ve been testing all these pastel highlighters, I have kept using my Sharpies. I love the clear view tip and the “smear guard” quality of these pens and also how skinny they are so they fit easily into my pencil case. The green is a true green and that’s what I hold all other greens up to for comparison (green is important, ya know!). The colors are not pastel but interestingly they aren’t that far off from the pastel options. I trust the Sharpie brand and love everything they make, so I’m not surprised that I love their highlighters too. Buy Sharpie Clear View Highlighters on Amazon. Whenever I see people in Facebook groups asking about pastel highlighters, there’s always those few people who say: “Just get the Crayola Supertips, they’re the same…” and then a whole bunch of people glob onto that comment and agree. So I had to give them a try, of course. I pulled out the “most pastel” version of each color to test and was very disappointed. These are not highlighters at all. They’re markers. Of course, that’s what they’re sold as, but when so many people claim that they’re the same as highlighters, I guess I had some hope that it would work out. But the colors are not translucent at all and are dark over the black ink. In a pinch and for a super cheap price, go ahead and use these, but if you want a true highlighter, don’t fall prey to those recommendations. I found this pack of 100 markers at my local Walmart in the back-to-school section for just $6.67. But they’re available online for about twice the price if you really can’t find them locally. Buy Crayola Supertip Marker 100 Pack on Amazon. My Choice for the “Best Pastel Highlighter” Award goes to … wait! There’s not a single clear winner. But of the ones I tested, I’ve currently got three favorite brands. I’m still testing and playing and trying them out and hopefully one day soon, a single winner will emerge. But until that time comes, I’m using all three in different situations and ways. Let me explain. I keep the Stabilo at home on my desk because they’re simply too large to carry with me in my small pencil case or journal cover. But I like the look of the muted colors and have them close at hand when I’m updating my bullet journal at home. I like the Frixon Erasable highlighters because they’re erasable (yes, I make plenty of mistakes!) and also because of the “chalkiness” of the colors they give. I like the shade of green in the Frixon line too. The Monami Essenti gives me a nice soft pastel color and the pen itself is pretty with the sparkly cap. I know, I know, I know … that’s such a girly reason to love a pen, but I’m going to embrace it anyway! You haven’t made it this far into the blog post (and video) if you aren’t passionate about highlighters like I am. So I’m sure you have a favorite – or at least one that you’ve been using more than others lately. Or maybe I completely missed your favorite or one you want someone to try out. Let’s chat! Tell me which pastel highlighters you love! Hit me up on Instagram @pamtremble with a picture of your highlighters in action! DISCLAIMER: This post may contain affiliate links to Amazon, however, none of these highlighter reviews are sponsored. This is an unbiased, unpaid, unsponsored, no-BS review of these highlighters. Nobody gave me pens for free. Nobody paid me. Nobody promised me rainbows or butterflies to write nice things about them. Everything I write is my honest personal opinion. 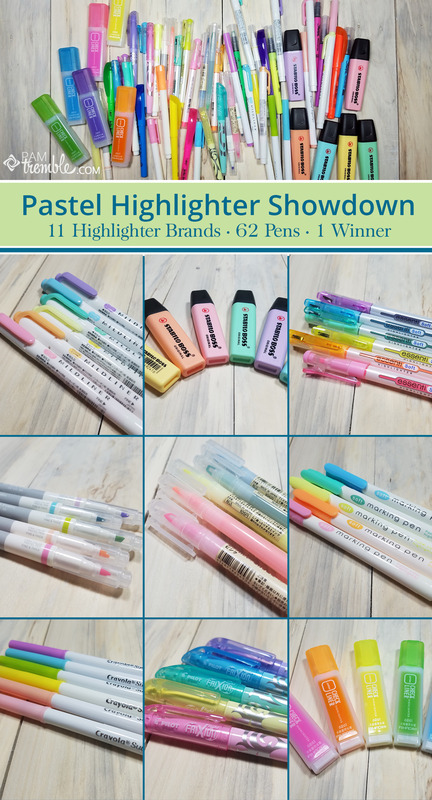 Pastel highlighters – 11 brands, 62 pens – swatched and reviewed! This is going to be the prettiest and most colorful fight to the death you’ve ever witnessed on the Internet. This time of the year is really crazy for me. I have a client who hosts a big golf outing every year and I handle all of the graphic design for that project – as well as sitting on the organizing committee to help with general event logistics and handle the technical aspects of the website registration system. I put in about 80 hours in the week or so leading up to the event. It makes for a very season and it takes several days to recover and get back to normal. I’m writing this from the chiropractor’s office. I just got an adjustment and I’m waiting for the massage therapist to take me back in a bit. I’m always very sore after spending so much time hunched over the computer screen for so many hours in a row and then spending a long day on the golf course to work with the rest of the committee on whatever needs to be done. My chiropractor always works magic and today he said that I really, really needed that adjustment because I “had a rib out” and my elbow was way out of whack. Gee, no wonder I was sore! This little visit will go a long way to getting me back to normal. And it’ll be nice to regain my focus on what else is going on in life and get back into a normal routine. Do you have time in your life when everything else has to fade away so you can focus on just a single thing until it’s done and you can get your life back again? Maybe it’s a big event like mine, but maybe it’s just a season in life that comes around once in a while like a wedding or family reunion or maybe back to school season when you have to get the kids ready for their school year. One of the big decisions I had to make in my life recently is that when something comes up and it needs my full attention, that I just need to give it my full attention and stop worrying so much about all the other things in my life that might also need my attention. I can’t be everywhere at once. I can’t be everything to everyone all the time. Instead, it’s healthier if I just pay attention to what’s in front of me at the moment and give it all my energy. Then when that thing is over, I can refocus on the rest of the things in life that need my attention again. My motto right now is “explore and be present” — the big part of that is to be present. Live in the moment you’re in. Give your energy to what is happening right now and stop worrying about all the rest of the things that can wait for another day. If you’ve been following along you’ll realize by now that I’m in the midst of a struggle to find my next new thing. I’m ready to take a break from new graphic design and brand management client work and move to something more sustainable for the long term. I want to stop trading my time for money and build assets that can sell over the long term with some upkeep, but not so much that I’m trading my time for money. Basically the traditional definition of passive income… but using the real definition, not the hot new version of the term that implies that I don’t have to do any work to earn the income. And when I say struggle, that’s truly what’s going on in my head lately because I’m having a hard time picking a direction to take and mustering the energy it’s going to take to build something completely new. But then I figured something out. It was a big lightbulb moment when I figured it out … it’s huge. But I can’t believe it took me so long to come to this realization. Ready for it? Brace yourself, it’s big. I don’t have to decide right now. I told you it was big. It was a big DUH! moment for me. Why am I putting so much pressure on myself to decide right this very minute about what the rest of my business life is going to be? I have a full-time day job that pays my bills and provides the benefits I need to live a comfortable life. The business income is nice but mostly it’s play money and feeds my dream of one day quitting my job and working for myself. But there’s isn’t an urgency for that side business to sustain my lifestyle completely right now. I’m tired. I need to take a break from service-based work. I need a change of scenery. I need a new challenge that excites me. I need a side business that gives me the added income I’m accustomed to so I have some pocket money that allows me to go on vacations, feed my electronic gadget habits, and keep me buried in art supplies. What surprised me about this big realization – when I realized that that I don’t need to make a decision right this second. I was shocked at how free I felt all of a sudden. It was like the universe had been weighing on my shoulders and was just waiting for me to figure out that I needed a break. Why was I putting so much pressure on myself to have a new side business lined up before I even finish the current one I have now? Well the answer is simple if you know me even a little bit … it has to do with being a control freak and needing to know all the future plans and have lists of tasks lined up ahead of time. But why? Why do I have to operate like I always do and have all the things lined up neatly in a row? Why can’t I just chill out for a minute? Why can’t I just let life happen and enjoy the view? Why can’t I take a break and just play for a while? It’s been a while since I gave myself permission to play. Putting it on the calendar and scheduling it into my life. I think it’s about time to change that situation. Years ago I converted one of the bedrooms in my house to an art studio. It’s huge and beautiful and stocked with (too many) fun art supplies. I used to spend hours upon hours in that room just playing, making and creating, experimenting and discovering. I love my art studio. But then when I found myself in an “emergency house repair” situation 18 months ago, my art studio become the storage space and catch-all area for household stuff that needed to be relocated during construction. That construction project took nearly a year of DIY work but my little art studio never recovered. It’s still piled high with boxes and bags and books and miscellaneous crap that just needs to be sorted and purged. I want my art studio back! So that’s my next big project. I’m giving myself permission to play. Permission to explore and be present. It’s time I swapped my computer mouse with a paint brush and glue gun for a while. I’ll chronicle the process, of course (yes, I’m even going to show you the “before” pictures – maybe even a video – of what the art studio looks like right now, before I dig it out. Yikes!). I’ve come to love this little blog I’m creating and I want to use it more to document how my journey progresses. So it’s time I got back to the art of play and I’m going to take you along for the ride.